Guys! Guys! 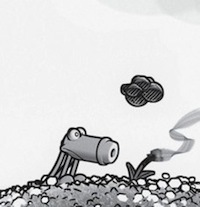 I forgot to mention I'll be at the Breda Kunsstripbeurs on september the 10th! Should be sweet – the previous one, in Utrecht last year, was excellent, anyway. I hope I can find time to make some new works, but I'll be bringing all the usual stuff anyway (posters tshirts prints originals bundles mushrooms and gnomes). I'll be joined by Erik Wielaert, Eric Snelleman and Coen Vosveld – half in half another Gr'nn outing then, though we'll all mainly be showing our own stuff there. Oh! And! 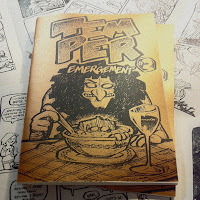 Anyone fancy me doing a reprint of Temper's first little outing? Lemme know in the comments! I might just manage to get it printed before then.